Info: Created on 19th January 2017 . Last edited on 10th February 2017. Congratulations! FontStruct Staff have deemed your FontStruction worthy of special mention. 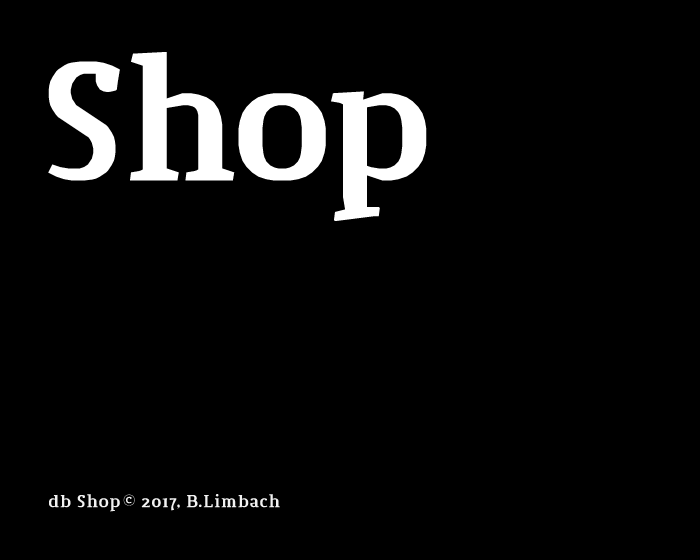 “db Shop” is now a Top Pick. High quality work, as always. I especially love the g.
This work are in progress! When I install the font some bricks/blocks are wrong. Thanks to Laynecom & Frodo7 for your estimated comments. @ Frodo7 What do you think about M/N? A very impressive fontstruction. Amazing to think that each glyph and curve is individually handcrafted, brick by brick. @beate: Well, I like the M. Nice and sturdy. The N looks lighter with the inktraps. Both letters look very natural in text samples. I think, the C,€ and G look a bit smaller - they need more overshoot. The pilcrow (¶) is very unusual. Normally, both stems go to the top. Sometimes there is just one stem. Love the "personality" of this.